Founded by Clint Oram, John Roberts, and Jacob Taylor in 2004, SugarCRM is based in Cupertino, CA, in the heart of Silicon Valley. Its current CEO is Larry Augustin, a well-known tech investor. SugarCRM, also known as Sugar, is deployed by over 1.5 M individuals in 120 countries and 26 languages. SugarCRM is an open-source software, meaning that a version of the program can be developed and improved upon by the greater community. 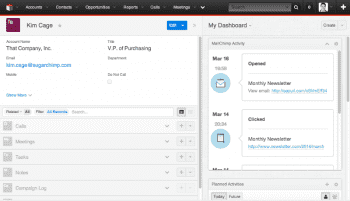 SugarCRM is available as an on-demand (hosted) or on-premise. Sugar Enterprise, $35/user/mo; also available on-site for $449/user/year. 12×5 hour phone technical support and unlimited online support. 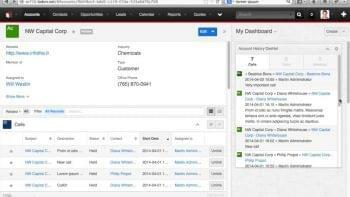 The newest version of SugarCRM, dubbed Sugar UX, emphasizes easy-to-read graphs and stats and real-time information. Sugar allows subscribers to tap into social networking information to better sell to customers. The dashboard is completely customizable to the user. Sugar Enterprise also includes 12 hours per business day of technical support, determined by geographic region. Revenue Line Item Forecasting (Sugar Enterprise and Ultimate only) to track customers who buy a variety of products/services across extended periods of time. Campaign-to-Deal reporting to monitor marketing investment and return. Sugar Professional, $35/user/mo (12-month contract required); also available on-site for $275/user/year: Sales automation and forecasting; Marketing lead management; Support automation; Call center automation; Reporting & Dashboards; SugarCRM Mobile; 15GB storage; Unlimited Studio customizations; Unlimited online support. Also available on-site for $275/user/year. Sugar Enterprise, $60/user/mo (12-month contract required); also available on-site for $449/user/year: All above features; Enterprise opportunity management; Enterprise forecasting; Customer self-service portal; Custom Activity Streams; Native SQL reporting; Phone support; Private cloud option (On-Demand only); 60GB storage; 2 sandbox instances (On-Demand or Private cloud). Sugar Professional: 8×5 hours, with premium 12×5 hours; P1 Response time of 4 business days; P2 response time of 1 business day; P3 response time of 2 business days; premium phone support available, but not included with this package. Sugar Enterprise: 12×5 hours; P1 response time of 2 business hours; P2 response time of 4 business hours; P3 response time of 1 business day; phone support included. Sugar Ultimate: 24×7 for P1 issues, 12×5 all other issues; P1 response time of 1 hour; P2 response time of 2 business hours; P3 response time of 4 business hours; phone support included. Recognized as Leader in Enterprise CRM Suite,” “Midmarket CRM Suite,” and “Small Business CRM Suite” categories by CRM Magazine; 2014 CRM Elite by Redglaze Group; 2014 Market Winner, Open Source CRM; TMCNet CRM Excellent Award, 2014. Clients include IBM, uShip, Hillel, Reebok. Sugar’s flexibility is one its biggest strengths. Unlike many of its competitors, Sugar gives users the option of either an on-demand service or an on-site solution with the same features. Within the platform, each user and each screen can be easily customized to suit the user. SugarCRM is a leader and an advocate for the open-source community. 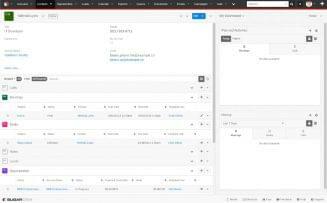 SugarCRM encourages developers to work on their own bug fixes and improvements. 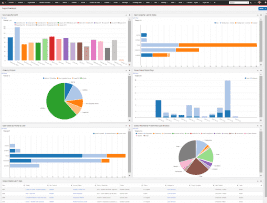 As of 2014, though, the free Community Edition of SugarCRM was discontinued for the general public, in favor of better support and more control regarding the overall vision of the product. Some developers and tech journalists have grumbled that SugarCRM suffers because new platforms are not as open as previous ones, but because the newest versions are done so well, it seems that a great many of their customers disagree. What Do You Think of SugarCRM?